A decent offer for up to 30% off when buying Starpoints has been launched though it is not as good as the up to 50% we saw before Christmas. 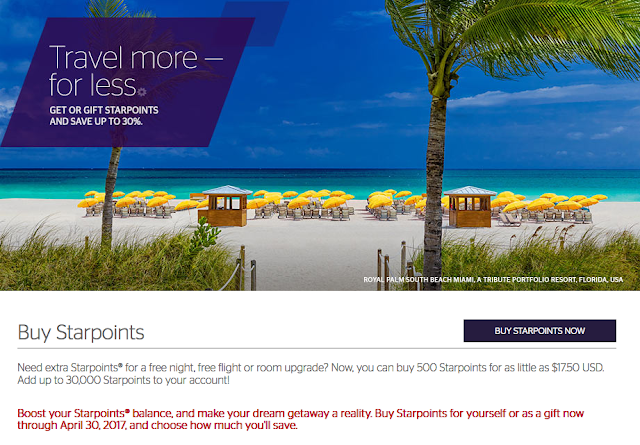 This brings the price down to US 2.45 cents each or under 2 cents per airline mile if you take advantage of SPG's 5,000 mile bonus when converting 20,000 Starpoints at a time. A pretty good price seeing that you can get higher value out of the points if you redeem strategically!